It's Nancy Pelosi, Adam Schiff, Khizr Khan, Al Gore, Carole King, and Carville here! And we're all emailing you because we've got a helluva opportunity on our hands. - We're winning the House by 14 points. FOURTEEN!!! 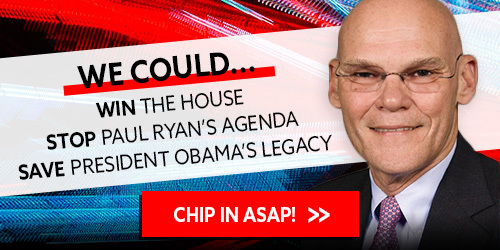 - That means we could WIN the House, STOP Paul Ryan's agenda, and SAVE President Obama's legacy. - It's the biggest loss we could EVER hand Trump. He'd be S-C-R-E-W-E-D!!! Byong -- my friends at the DCCC have a plan to register and mobilize a record number of Democrats and WIN! They've got a $2OO,OOO budget gap to fill before the crucial End of Month Deadline in 48 hours. And I'm told you haven't renewed your 2O18 Democratic Membership! Will you rush in $2?